New Orleans Mayor LaToya Cantrell has a 57 percent job approval rating overall, according to the 2018 Quality of Life Survey conducted by the University of New Orleans Survey Research Center. 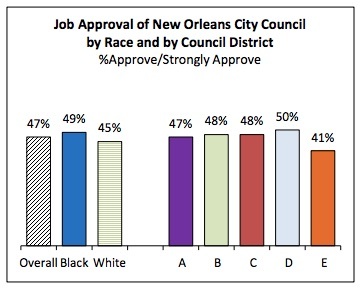 The survey, known as the UNO Poll, also found that Orleans Parish residents consider crime to be the biggest problem facing the parish, and nearly half of New Orleans residents approve of the job the City Council is doing. The survey of 500 Orleans Parish voters and 500 Jefferson Parish voters took place from Oct. 17 to Nov. 5. There is a margin of error of plus-or-minus 4.4 percent. The UNO Survey Research Center began its Quality of Life series in 1986. Since then, the quality-of-life and government services in Jefferson and Orleans parishes has been assessed approximately every other year. The 32-year time series can be used to assess the effects of events, programs and policies. The surveys are designed to provide an ongoing picture of how voters view local government services and the general quality of life. They highlight the problems that are of greatest concern to the voters, as well as areas of satisfaction in their parish. The results of the Quality of Life surveys represent the perceptions and opinions of the registered voters of the two parishes. The results are not objective measures of the quality of life or the quality of government services. In addition to Mayor Cantrell’s 57 percent overall approval rating, New Orleans City Council hovers close to 50 percent. District D has the highest with a solid 50 percent approval. 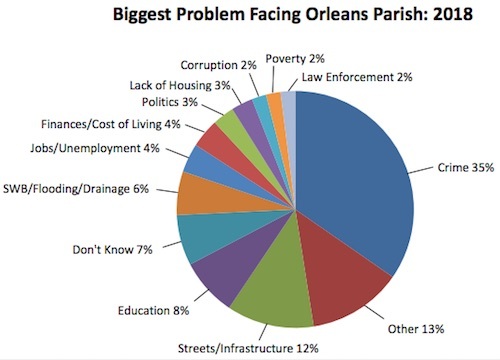 Crime is the biggest problem facing Orleans Parish, according to 35 percent of Orleans Parish residents surveyed. For more information, see the complete 2018 Quality of Life Survey.